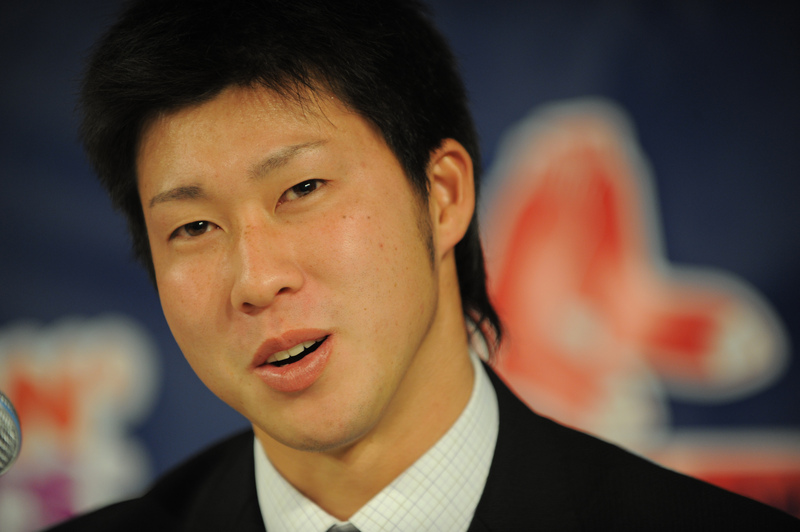 Welcome to Boston, Junichi Tazawa! “The Big I” comes through again! Here’s our first glimpse of Tazawa as a member of the Red Sox. I’m happy to report that we have just announced the signing of Japanese righthander Junichi Tazawa. Now, granted, for many of you this probably comes as no surprise, as it had been reported that we were the leading contenders to land the young (he’s 22years old) pitcher, but nonetheless, it is great to see us continuing to scour the globe for the best possible talent. Tazawa was introduced today at a 3pm press conference. Sayonara from the Front Office! BOSTON, MA–The Boston Red Sox today announced that the club has signed righthanded pitcher Junichi Tazawa to a three-year major league contract extending through the 2011 season. No further terms were disclosed. The 22-year-old joins the Red Sox organization after a four-year amateur career with the Nippon Oil ENEOS of the Japan Industrial League. With the addition of Tazawa, Boston now has 39 players on its major league roster. This past season, Tazawa was 13-1 with 5 saves and a 0.80 ERA in 21 games/11 starts. He struck out 114 batters and walked just 15 over 113.0 innings pitched. 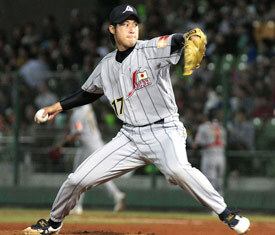 In November he led the ENEOS to the semifinals of the league’s corporate championship and in his last start of the competition, a quarterfinals match-up in Osaka on the 21st, Tazawa allowed just four hits and struck out 10 in a complete-game shutout, one of four during the 2008 campaign. In September, Tazawa helped Nippon Oil win the 32-team Intercity Baseball Tournament for the first time in 13 years. He appeared in all five of the ENEOS’ games from September 1-9, and earned the event’s Most Valuable Player award going 4-0 with one save and a 1.27 ERA. He tossed 8.0 innings or more with double-digit strikeouts in each of his first two tournament appearances, including a complete-game, five-hit effort on September 4. Overall, the righthander fanned 10 or more batters on four occasions in 2008, and earned MVP honors in the Sports Nippon Tournament after a career-high 18-strikeout performance in a quarterfinals start on March 23. The Yokohama native spent each of the previous three seasons with Nippon Oil after making his Japan Industrial League debut in 2005. Tazawa graduated high school from the Yokohama College of Commerce and was a member of the 2003 team that played in the Koshien Tournament, though he did not appear in a game. It’s nice to see the Red Sox finally making some movement. And thanks for once again bringing us the “inside scoop”! I hope he’s better at living up to the hype than Dice-K. I admit Dice-K has a winning record but only because of our defense and bullpen. Dice-K walks way tooo many batters & isn’t very good in do or die situations. I think we need another knuckleballer. Nice. You know who would be the perfect man to teach and guide him to superstardom in Boston? Jason Varitek! Dice-K called Jason Varitek his favorite American. Wow. Jon Lester, Justin Masterson and Jonathan Papelbon all told me they love and respect Tek and have learned and will continue to learn so much from him. Let’s go boys in the office….we are waiting for the ink on the contract to dry, so we can celebrate signing Jason Varitek in a Big traditional Boston way! We really need something like that to celebrate. We have the greatest baseball team on the planet, let’s not let that slip away by letting the Captain go!